Henn Na Hotel is known to be the first robot hotel in the world, but that doesn’t necessarily mean it’s going to be a good hotel. The robot hotel Japan doesn’t live up to the crazy expectations I had from seeing futuristic movies. The Henna Hotel did not even meet the expectations of a 2-Star Motel. I found out about the place from Atlas Obscura. A site known for obscure destinations. Most of my journeys have been fueled by Atlas Obscura so they have high credibility with me. “Henn na” or “Henna” in Japanese translate to weird, strange or unusual. This is true, because when you see a robot velociraptor at the front desk, you’ll think this is a weird hotel. To get to Henna hotel Nagasaki you first have to get to Nagasaki. Then take the train for about an hour North to Sasebo at the Huis Ten Bosch stop. A shuttle service runs every 15 minutes from the road at the Huis Ten Bosch stop to Henn Na Hotel Nagasaki. In my situation, I decided to take the walk since it’s about 15 minutes from the station any way. We arrived to the Henn Na hotel Japan at 1pm, 2 hours before check-in at 3pm. There was no early check-in, because Japan is very strict about check-in times. There was no “real” person to ask if we wanted to any way. We were able to hangout in the nearby lounge with free Wi-Fi. The reception robots activated around 2:45pm and we were able to check-in 15 minutes early. The robots at check-in are mainly voices that direct you to use the self-service check-in computers. The robots move around a little as they talk, but that’s it. There were 2 robot velociraptors and one robot lady. The robot lady had a scary face so I went with the robot velociraptor. At the check-in counter, you’ll find yourself in front of a robot and two screens. At the large screen facing you, you’ll select Check-In or Check-Out. After selecting “Check-In,” you’ll be redirected to the smaller screen directly in front of the robot and the robot begins moving. Next, you’ll select your language and the robot will begin speaking. You’ll fill out some data and scan your passports. There was trouble with scanning mine so it took a few tries before getting it to work. Then, you’ll receive a receipt with your room number and one key card to your room. I saw the robots docked, but they didn’t come out to get our luggage. There wasn’t any worker in the lobby to help set this up. It turns out the robots that take luggage to your room were out of order. If you wanted to store your luggage securely for the day, you could store your luggage in this large storage area that can only be accessed by a robot arm. 500JPY to store luggage with this robot. I chose not to use this service. There were also a bunch of items and amenities for sale in the lobby…but you’d have to find a person to buy from. I was really looking forward to Lazy Time! I was going to buy this, but there was no attendant to buy this from. The robots had no idea what I was saying. There were a few gardening robots in the grass, but they weren’t moving. By the looks of the grass, the robots haven’t moved in weeks. I later saw an actual person gardening to pick up the slack from these lazy robots. You’re doing a crappy job, robot. To get into the room, there is a door key scanner (typical for most hotels), after that cleared, you had to press the “SCAN” button for the facial recognition scanner, then you could open the door. That facial recognition scanner was very inconvenient since it misread my face several times. I’m not sure what it bases it on. I checked-in so I’m assuming that’s where it scanned my face (or off my passport—bad photo) but when my friend tried to open the door, it scanned his face with no problem. At least that’s what I thought, he just used the key to open the door. The facial recognition system was all for show. The hallways to the rooms were outdoors, very reminiscent of motels. This was only a concern because that makes it much easier for insects to get into the room. This was definitely a problem because there were mosquitoes in the room and a giant cockroach. The cockroach was so big that it needed facial recognition to get in. 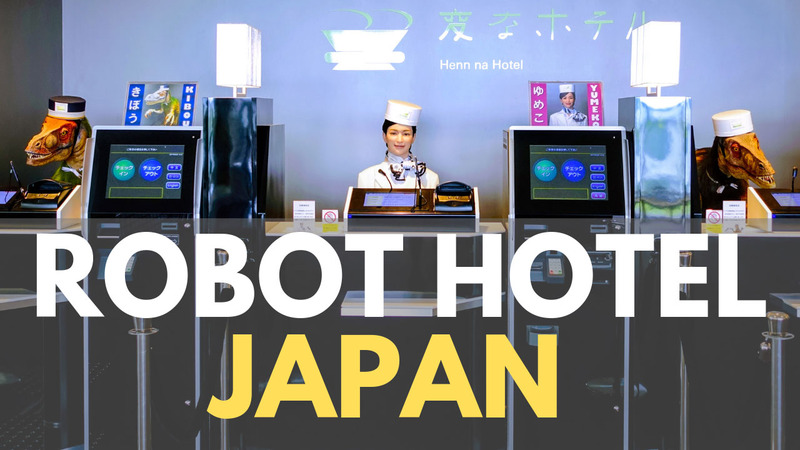 For a robot hotel in Japan, it was much like a standard business hotel. I’ve stayed in very similar Best Western hotels in Japan that were like this. The only difference was that there was a robot helper “Churi” in the room. The robot said she could control the lights or tell us the weather, BUT when we made those requests none of them registered with the robot. It’s like an Amazon Alexa, if Alexa didn’t give a crap about what you were saying. Since we registered the room in English, the robot was speaking in English so it’s nice to see at least those things linked up. Unfortunately, this robot helped wouldn’t shut the hell up. She would just randomly activate and say the weather when the room was completely quiet. We had to unplug her to get some sleep. My friend cut his foot walking around the floor barefoot. That’s because the floor was dirty. I stepped on a few things too and switch to exclusively slippers in the room. After a long day of walking around Huis Ten Bosch, it was time for sleep. I untucked the bed covers and found a few hairs. I haven’t been on the bed yet. I look under the pillow and see a few more hairs. Someone slept in this bed and the sheets haven’t been changed! My friend was lucky enough to have a bed that was cleaned. At that point, I just wanted to get a refund and continue on to another city. I looked at the train schedule but it was too late to leave. The last train to get me to Fukuoka (the next destination) had already left for the night. Then I called reception to change my sheets. Me: Hi, I’d like the sheets in my room changed. Reception: (2 minutes later) Hello? The “ok, one moment” happened four more times over 10 minutes. They then said they’d come to the room. Later, housekeeping arrived and knocked on the door. I opened to door to find a lady from housekeeping holding an iPad with a live stream of a guy wearing a headset. She spoke to the man in Japanese and then the man spoke to me in English. Interesting solution. We had a conversation for a few minutes about what the problem was. Then housekeeping came in to inspect the bed and confirmed that it was a problem. She left and came back after a few minutes to change the sheets. I slept pretty well but woke up with a mosquito bites on my feet and legs. Damn it. To stay here one night the cost was $182 USD and it was severely disappointing. I would not recommend staying here. If you’re planning on going to Huis Ten Bosch, take a day trip and plan t o catch the last train. Bosch hotels can be very expensive! The Bosch hotels look fancy though, but you don’t really have to stay there to experience the lobby and dining. Person seen landscaping. Robot seen relaxing. I didn’t know this until I got here, but Henna Hotel is right next to a Dutch City Themed amusement park. That amusement park is call Huis Ten Bosch, which makes a lot of sense after the fact. The biggest highlight at the theme park was eating at the Huis Ten Bosch Robot Restaurant. It was nice to see actual robots doing a good job! Unsurprisingly, the robot hotel in Japan ended up laying off over half of it’s robot employees. The robots caused more work for the humans at Henn Na Hotel Nagasaki and a bad customer experience is bad for business. I stayed here and it was pretty bad. If you really want to visit Henn Na Hotel Japan, you don’t really have to stay in the hotel. Most of the robot stuff is in the lobby and you can just go check it out. Definitely way over priced for what you get. If you want to go to Huis Ten Bosch, take a day trip here and stay at a hotel in the city. It was an ambitious attempt but the world is not yet ready for a hotel fully run by robots. This is still a small step in that direction..
Would I try another robot hotel? Absolutely. I’ll stay in any type of weird hotels as long as it’s not a love hotel. I draw the line at cleanliness. Which is why I was pleasantly surprised by how nice some of Japan’s capsule hotels are. I’ll try to look for more weird hotels in Japan to check out. I’ve already found some pretty weird Japanese bars and scary Japanese arcades. What’s the weirdest thing you’ve experienced while traveling?